One effective way of motivating employees is to provide rewards and incentives for their excellent performance and also for recognition of a job well done. Sometimes management in several organizations forgets these tools since it is felt by them that employees are paid the wages to do a good job. Management of these organizations should keep in mind that employees respond to recognition for good performance. This recognition can be given in the form of either rewards or incentives or both. These recognitions can be given in monetary as well as in non monetary form. The tools of rewards and incentives are used by the management of several organizations to motivate employees for carrying out of a task, for learning of new skills and for changing of behaviour patterns. Though the terms ‘rewards’ and ‘incentives’ are used for the purpose of motivating employees, yet both the terms are distinct terms. The distinction between rewards and incentives is sometimes get blurred and people generally can think that the two terms are one and the same. However this is not the case – far from it in fact. A reward is something that celebrates success once an action has been tried or completed. It is a thing that is given to an employee in recognition of service, effort, good behaviour, and/or achievement. It is something which is actually given to an employee after his effort or achievement. On the other hand an incentive is something that motivates an employee to perform an action. It is a thing that encourages the employee to do something. In fact incentive is a motivating factor for an employee to exceed expectations. Employee rewards and incentives can both be very effective motivators when used appropriately. In case they are not appropriate then they will not inspire the employees and hence will not have the motivating effect. Even though rewards and incentives are two separate components, effective rewards and incentives can help an organization to maximize its performance and to realize its full potential. 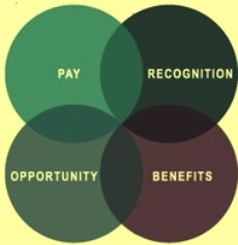 The motivating factors associated with rewards and incentives are shown in Fig.1. Rewards and incentives in the workplace are beneficial to both the employees and the organization. When recognized for stellar performance and productivity, employees have increased morale, job satisfaction and involvement in organizational functions. As a result, the organization experiences greater efficiency, improvement in productivity, increase in sales, and higher profitability. Through workplace rewards and incentives, employees of the organization enjoy a positive and productive work environment. The success of rewards and incentives as motivators depends if they are given through a transparent scheme implemented through a rewards and incentives policy of the organization. Rewards and incentives in an organization can either take an individual based approach or a team based approach. An individual based approach requires individual goal setting and the individual should have a large measure of control over his/her own performance. In this approach, a high value is placed on individual training. An individual based approach is not appropriate where the objective is to promote better overall performance through teamwork, cooperation and sharing of information and knowledge, or where individual performance is not measurable. Hence a team based approach is more preferable in many organizations since it promotes team values as well as cooperation between the employees in the organization. An organization should enhance its performance by adopting a rewards and incentives policy. The policy must be communicated clearly and frequently amongst all the employees within the organization. Success of the rewards and incentives policy depends on the training, reinforcement and the organization wise commitment specially from the top management. The following criteria can be used for the development of the policy. • There should be measurable assessment criteria. • There should be a formal assessment against these criteria. • The results of these assessments should be clear and transparent and of such a standard that a predetermined scale of rewards could be based thereon. • Rewards and incentives are to be given at such intervals so as to have continuous motivation of the employees for improving their performance on a continual basis. • In case of rewards and incentives which are having a financial impact, there should be a suitable provision in the budget for these. • The rewards and incentives should not be in conflict with the directives of the Government and the laws of the land. • The rewards and incentives should not be a part of the wages & salaries and should not be part of the collective bargaining with the trade unions. The primary purpose of rewards and incentives is to build a workforce which is not only motivated but also effective, efficient and accountable as well. It is geared to take up challenging tasks besides giving a healthy output. Besides this primary purpose, rewards and incentives results into the following improvements in the culture of the organization. Rewards and incentives can be monetary as well as non monetary. Monetary rewards and incentives encourage friendly competition and motivate employees to produce optimally. Non monetary rewards and incentives are given in the form of perks and opportunities. Rewards and incentives are usually designed to show the appreciation to the employees for their hard work. Whilst extra money is often cited as motivators for employees, it is often the intangible employee benefits which have the most impact on the morale. Regardless of the benefits, rewards and incentives create an atmosphere at the workplace where hard work gets recognized and rewarded on a regular basis. The following criteria need to be kept in mind while setting tasks and targets for the rewards and incentives. • The tasks and targets are to be be specific. These can be witnessed or observed, defined and concrete. • The tasks and targets are to be measurable. It should be possible to assess, evaluate, and distinguish different performance levels. It should also be possible to identify the end results in terms of quantity (output over a time period), quality (error rate, number of complaints etc. ), time lines (tasks milestone or completion date) and costs ( per unit output) as per acceptable standards or procedures. • The tasks and targets should be such that the same are achievable without barriers but should have challenges built into them. They should be reasonable and not so difficult as to make employees frustrated. • The tasks and targets are to be realistics and should be within the parameters of the individual/team’s job deascription. • The tasks and targets should have a time frame associated with them.